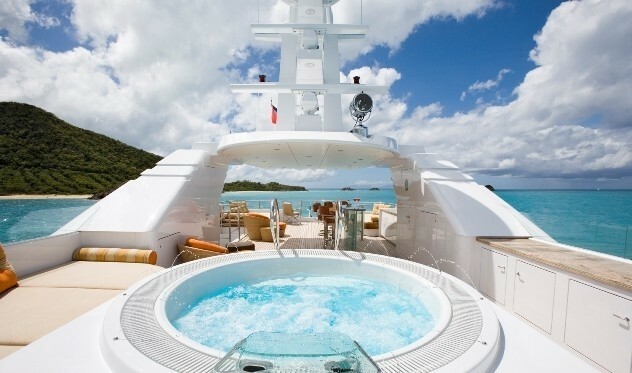 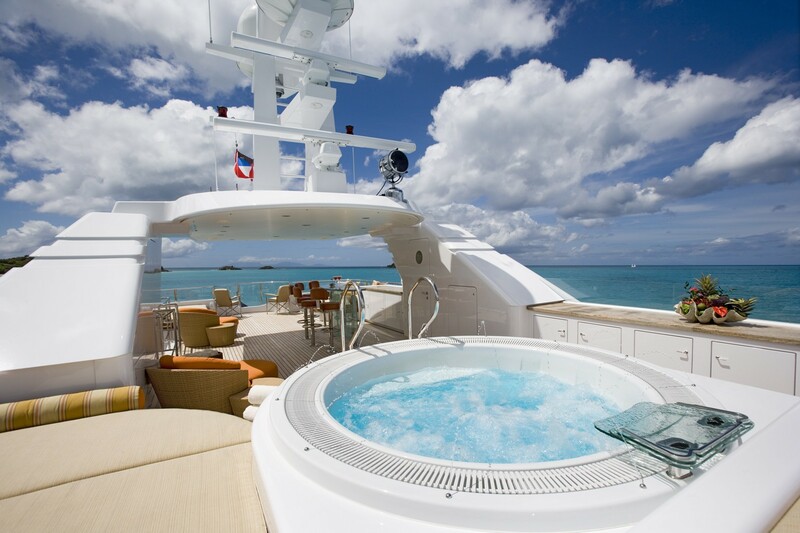 M/Y PERLE BLEUE is a 38m (124' 6") 2007 luxury motor yacht as built by Hakvoort with Interior Design by Donald Starkey. 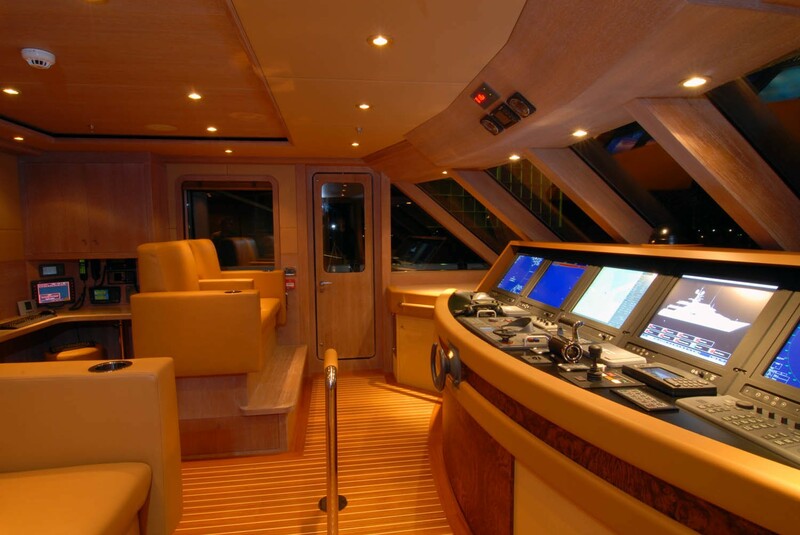 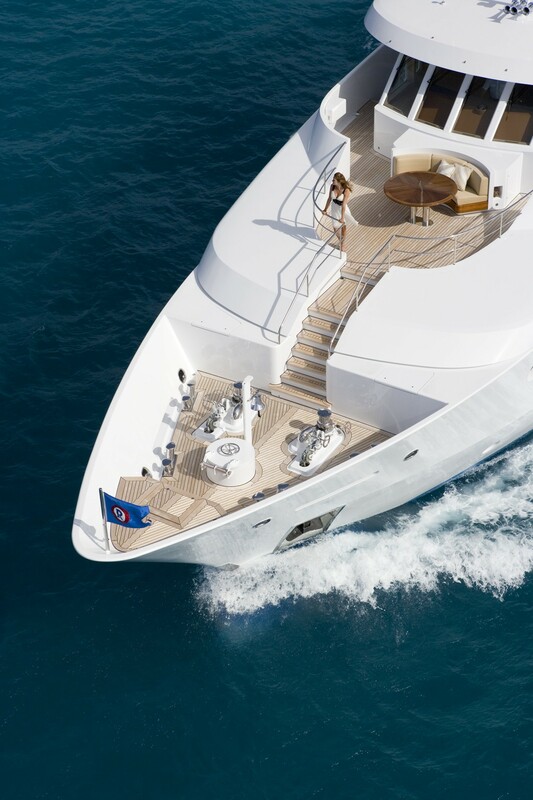 PERLE BLEUE is an absolutely beautiful yacht boasting many features. 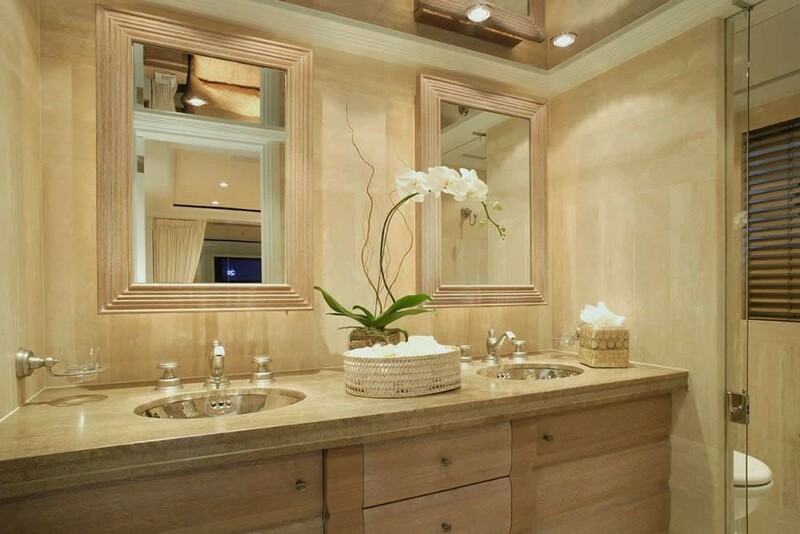 Her interior theme combines casual Asian tones with homeliness and simplicity. 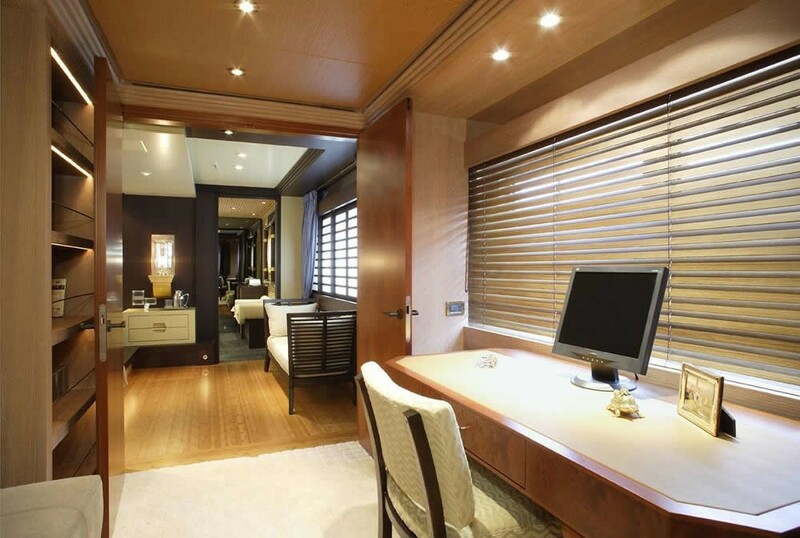 PERLE BLEUE has two comfortable salons, each with a distinctly different interior theme but equal in the amount of light and space created by the wide panoramic windows which frame each. 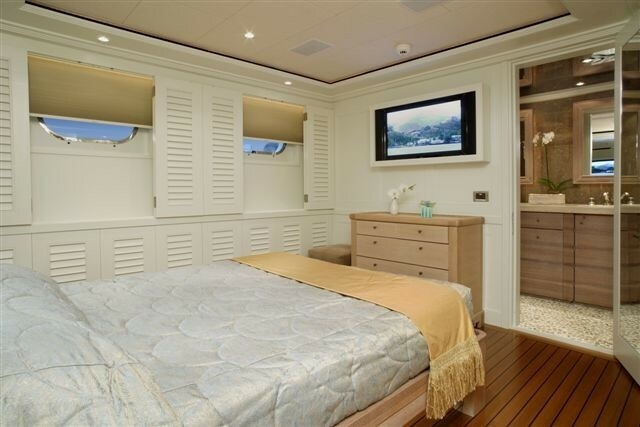 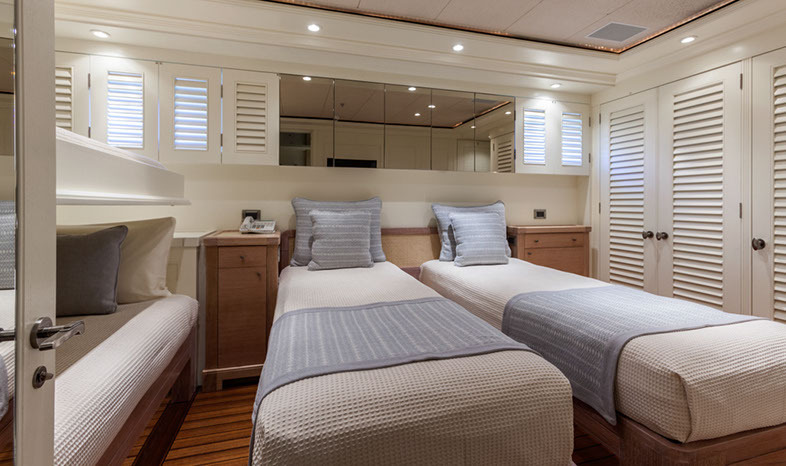 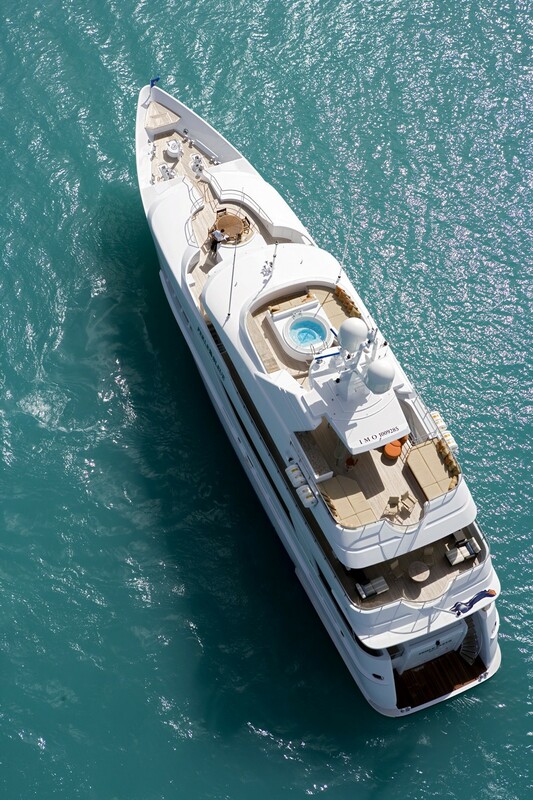 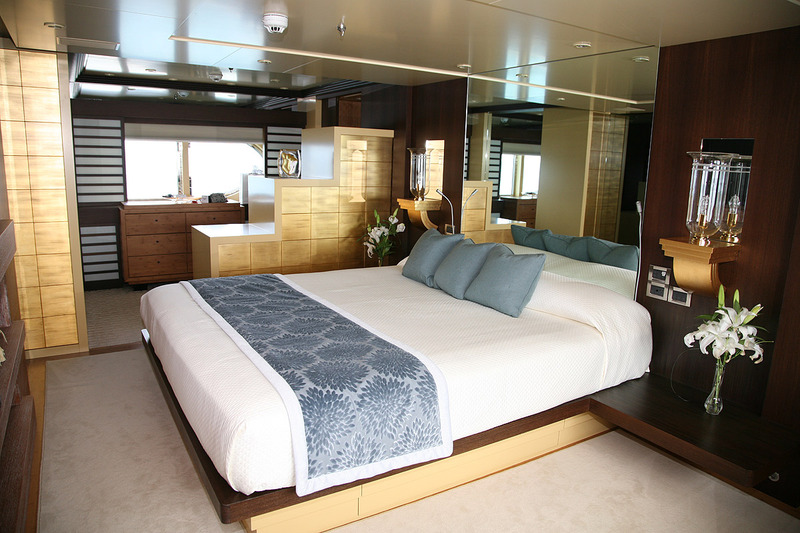 This luxury superyacht accommodates twelve guests and offers as particularly sumptuous and spacious owner’s suite on the main deck which includes a queen sized bed, a study, a walk in closet and a spacious bathroom with a large tub. 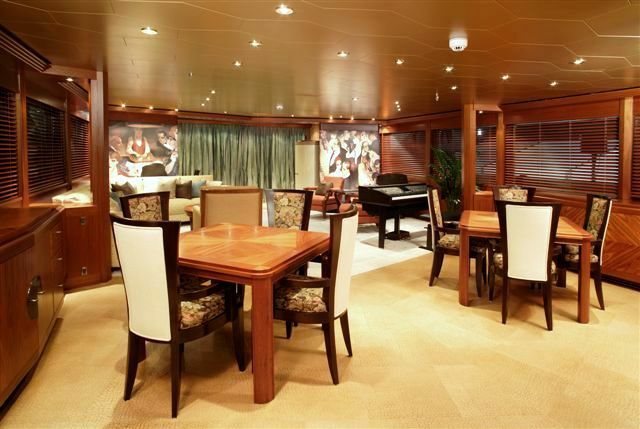 All other guests cabins are also beautifully furnished with a combined Asian and beachhouse theme. 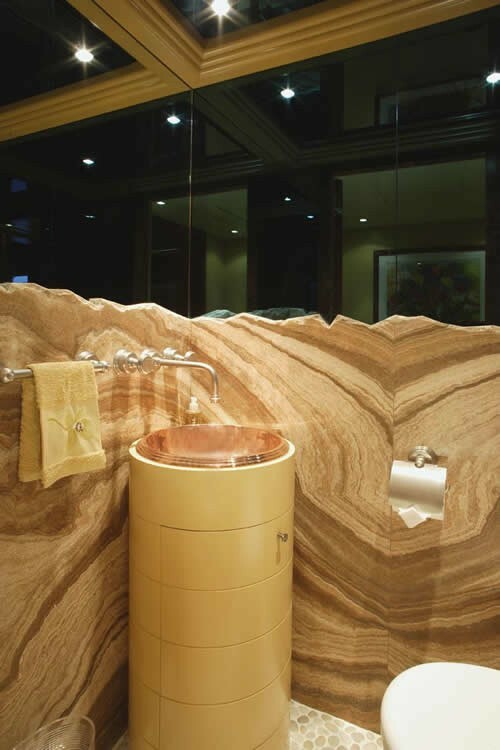 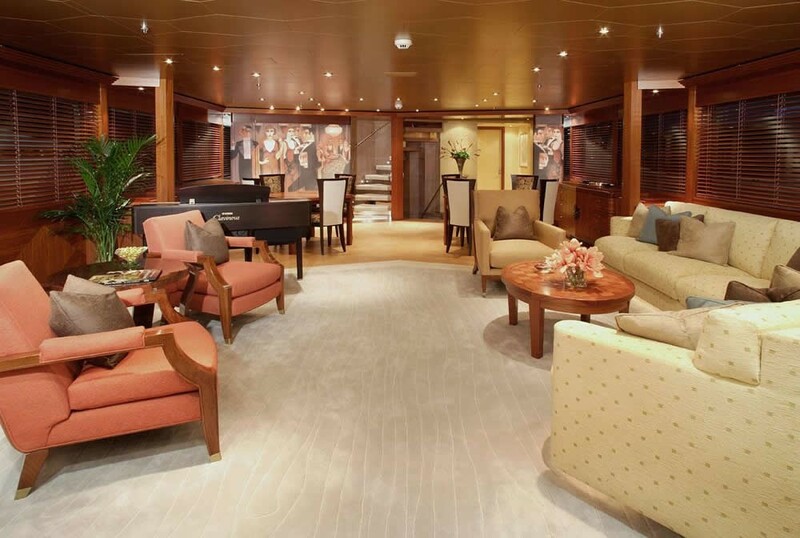 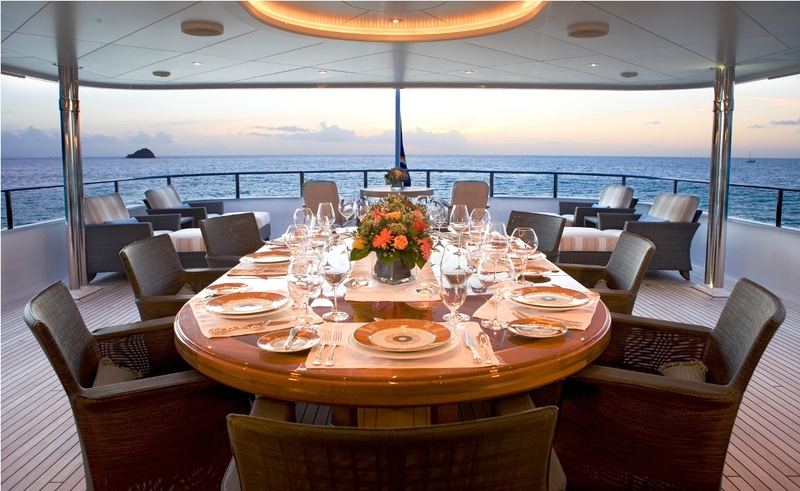 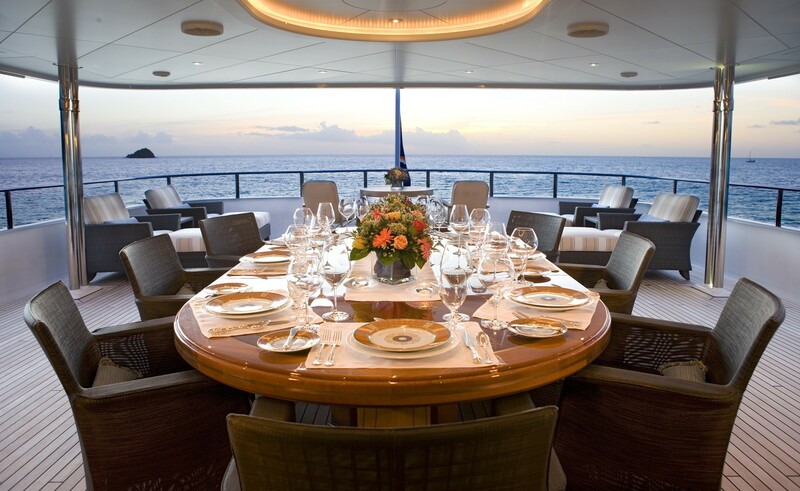 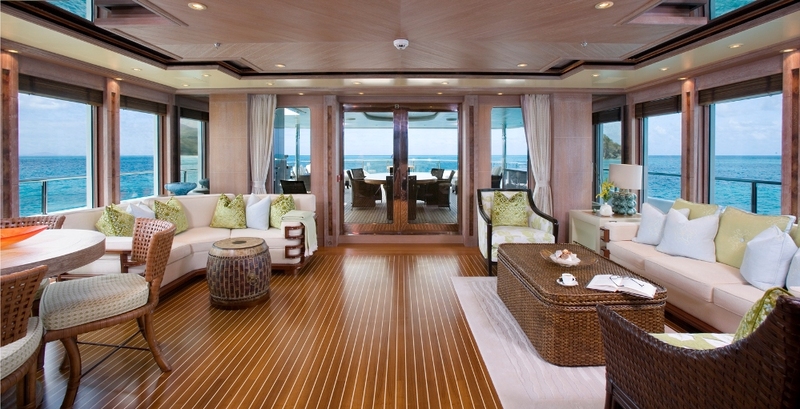 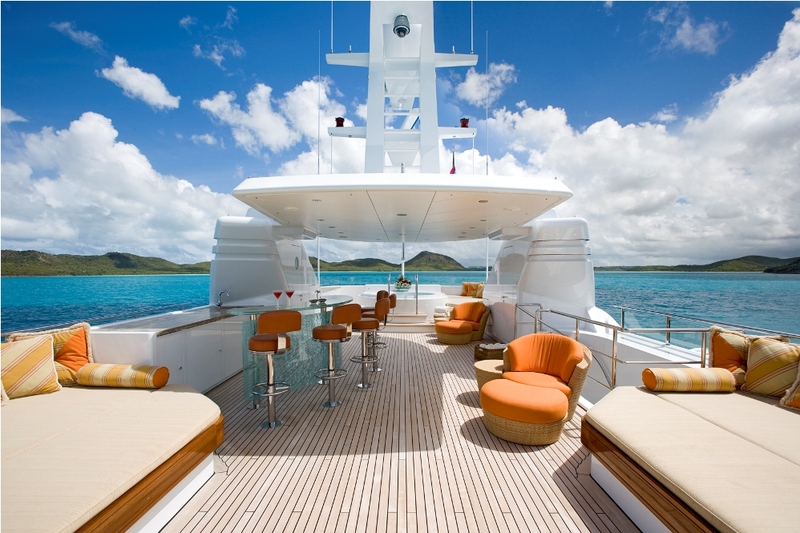 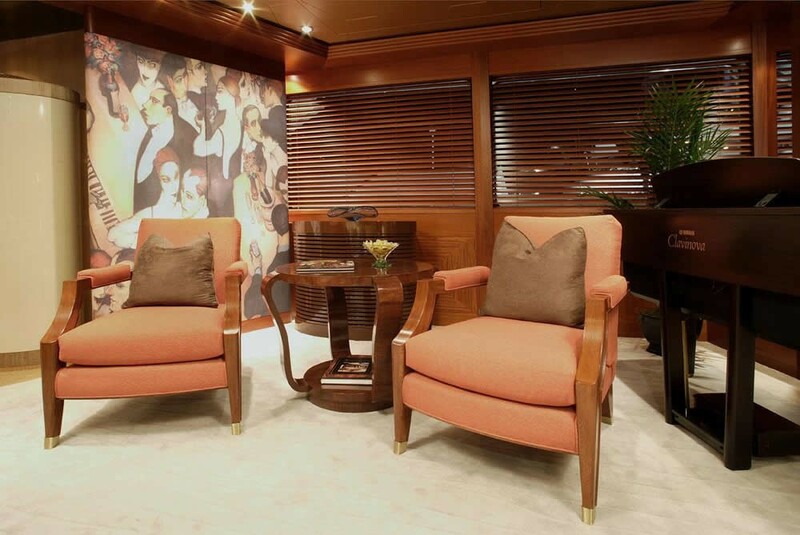 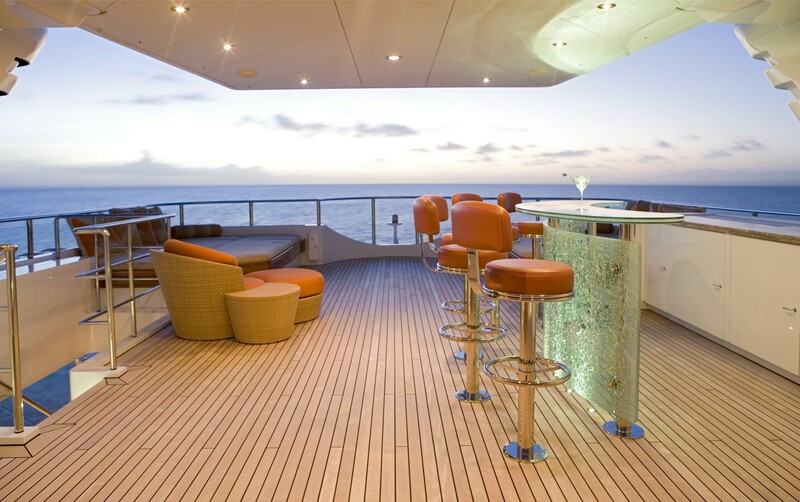 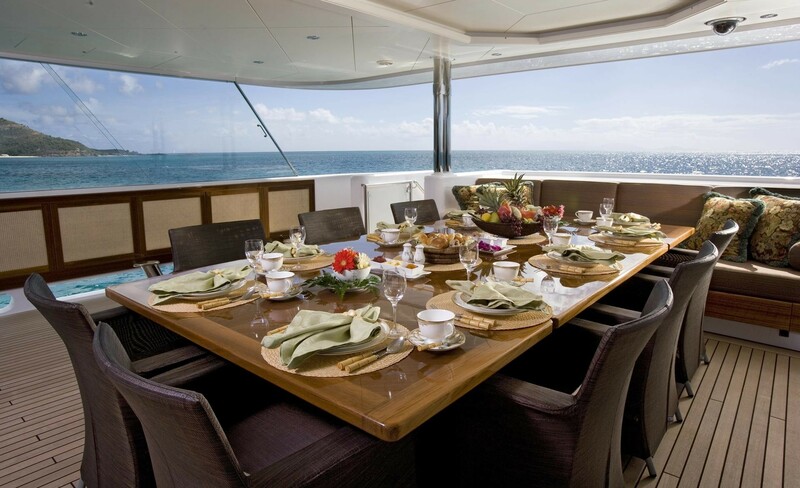 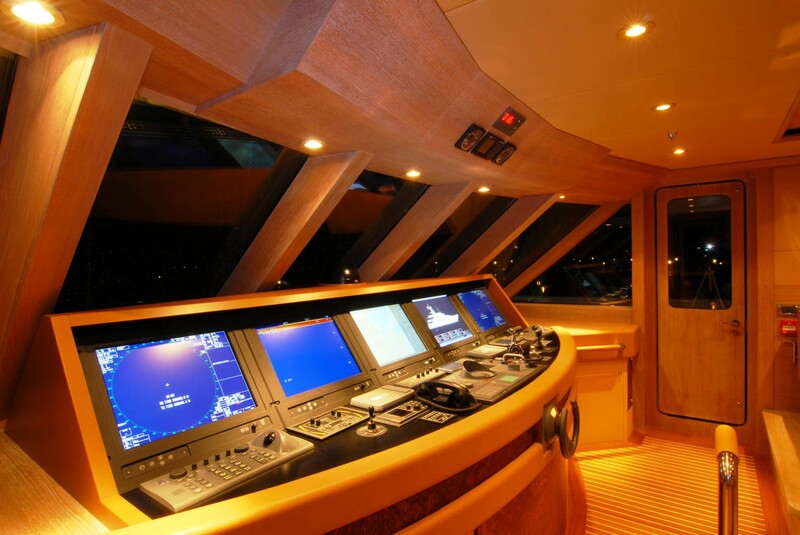 The beauty and eloquence of PERLE BLEUE’s design feature extend to her decks with sundeck being her masterpiece. 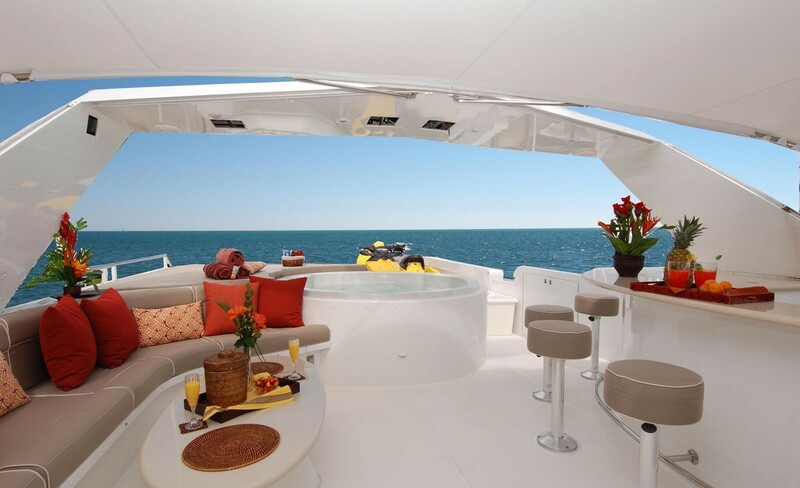 The entire width and length of the sundeck is useable guest space and includes comfortable sunpads and lounges aft, moving towards a 10 piece teppanyaki bar with 10 bar stools as a centrepiece and a deck Spa Pool with sunpads forward. Motor yacht PERLE BLEUE offers alfresco dining on the lower deck and main deck and a cosy Portugeuse lounge or observation area forward of the bridgeas well as a 10 seat Teppanyaki bar on the sun deck. 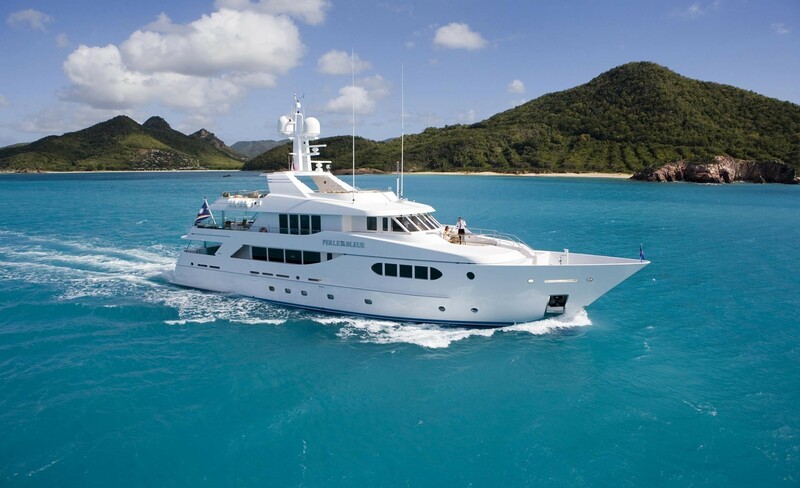 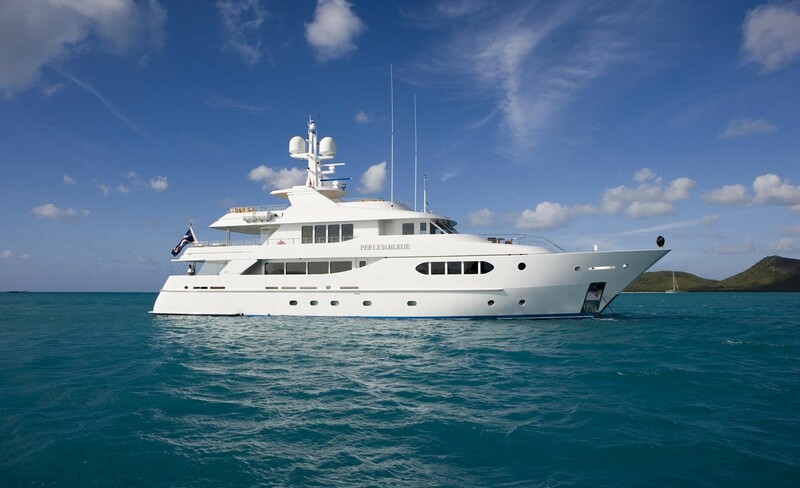 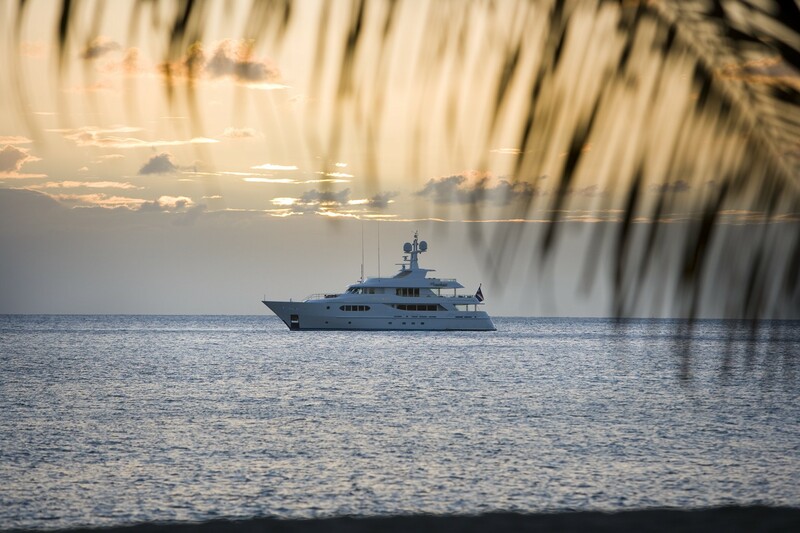 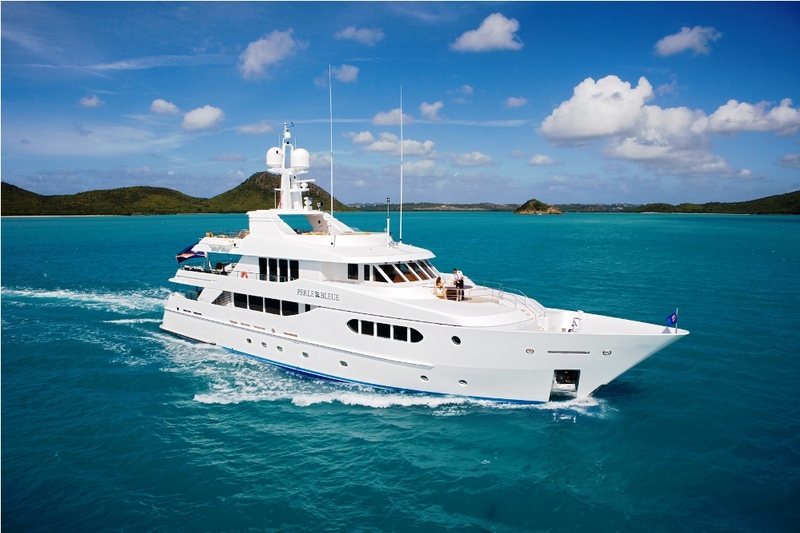 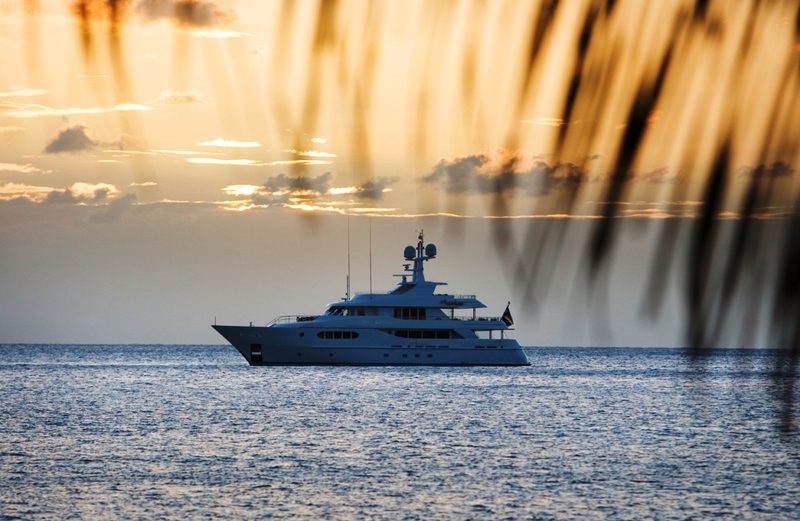 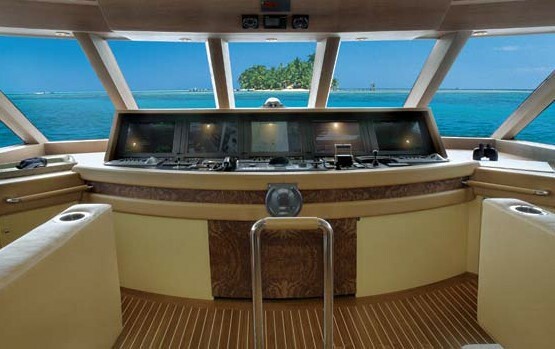 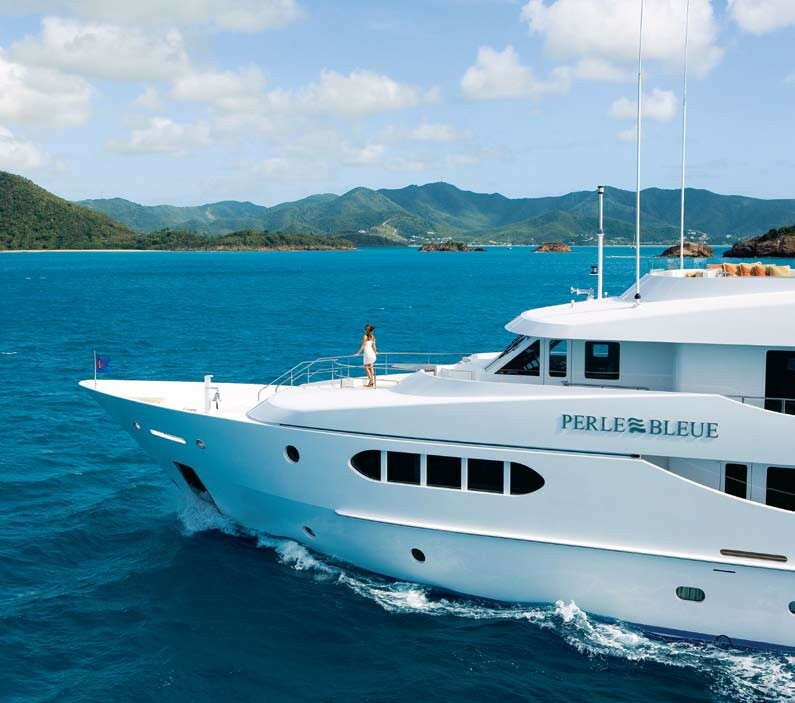 Motor Yacht PERLE BLEUE is maintained by run by 7 professional crew who look forward to welcoming guests onboard. 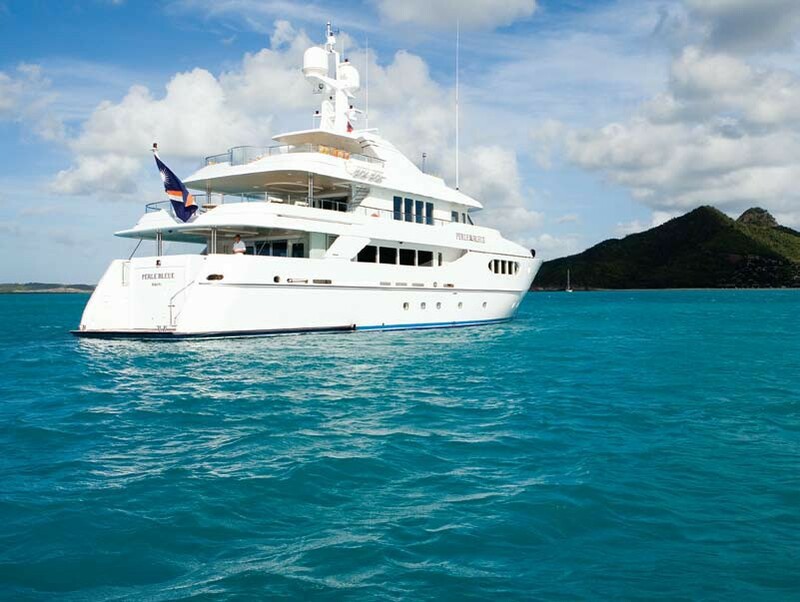 Yacht PERLE BLEUE waas refitted in 2013 which including the addition of a guest cabin (now offers five guest cabins instead of four), a teppanyaki bar, audio-visual/communications equipment and a superb watersports inventory. 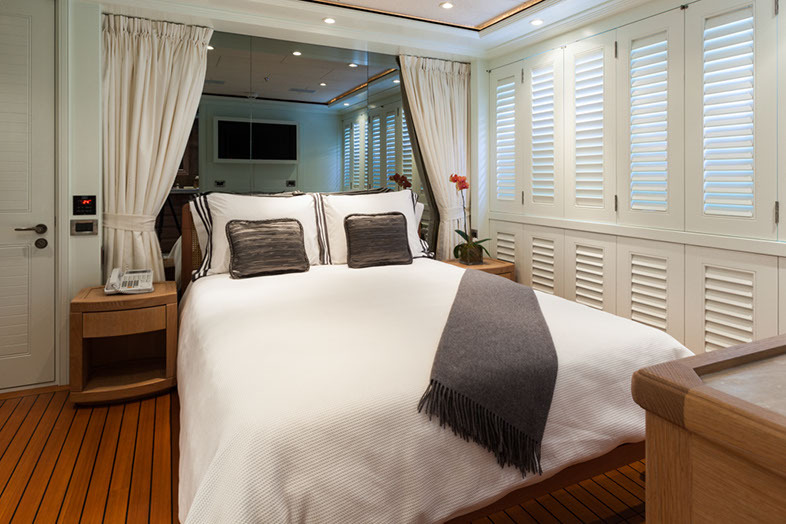 Motor Yacht PERLE BLEUE offers comfortable accommodation for 12 guests in 1 master suite, 2 queen cabins and 2 convertible twin/double cabins each with pullman beds. 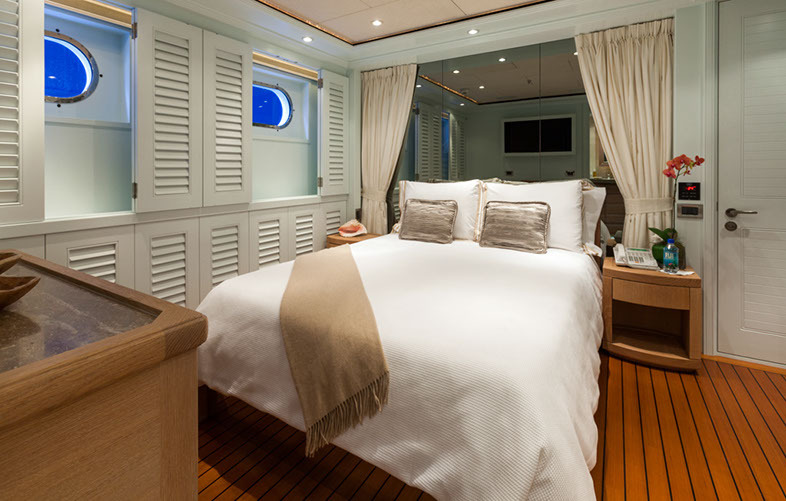 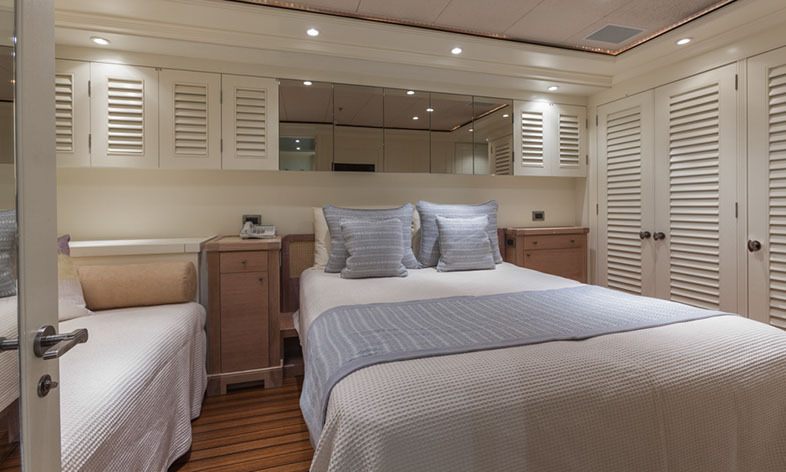 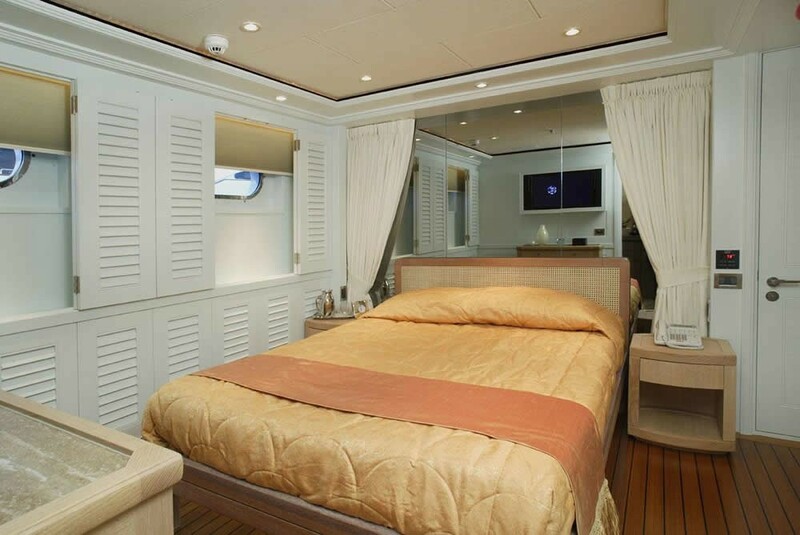 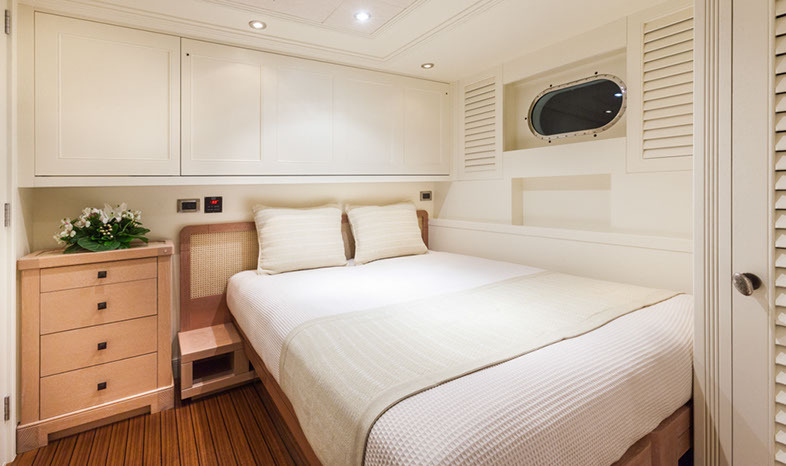 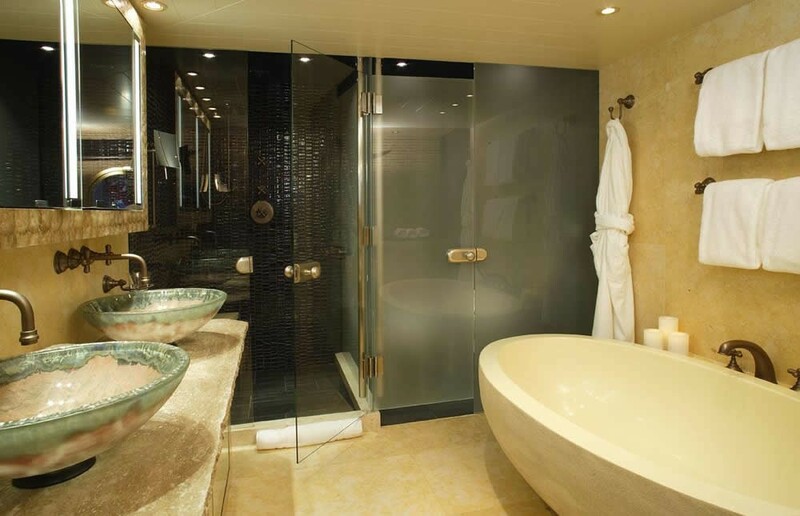 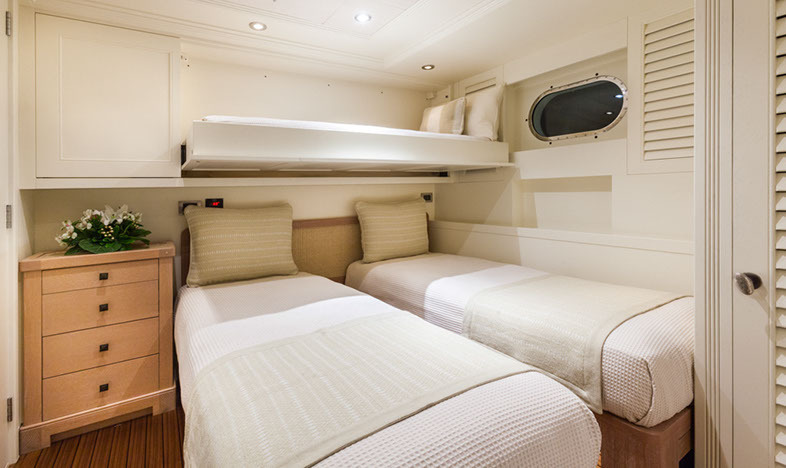 Each stateroom is equipped with a private ensuite and full entertainment facilities including a TV and a Kaleidescape system offering a range of movie & music choices. 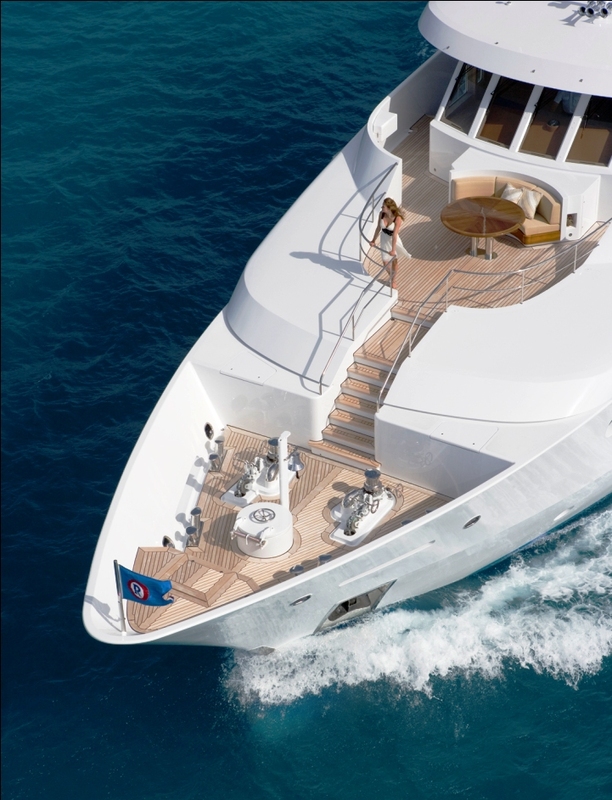 Motor Yacht PERLE BLEUE is equipped with a full range of toys including a 34 Pursuit tender powered by twin 300hp Yamaha engines. 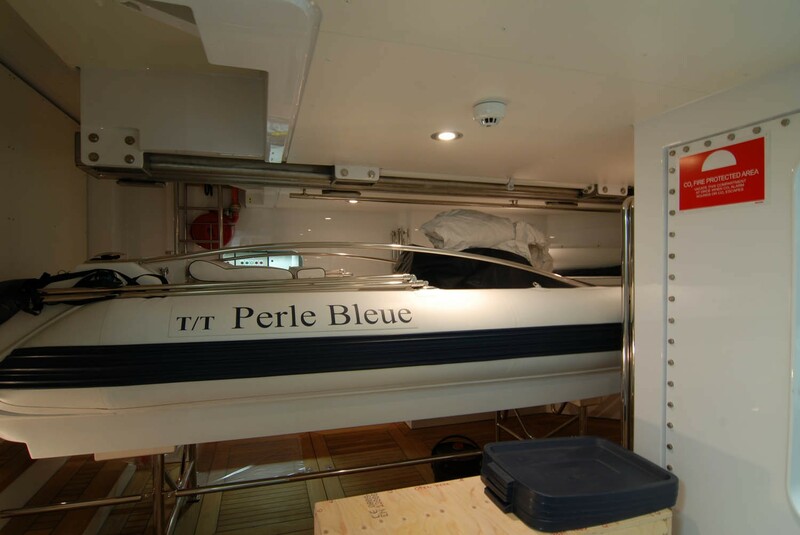 15'6" inflatable tender with its 90hp Yamaha is ideal for towing water skis, wake boards and inflatable toys. 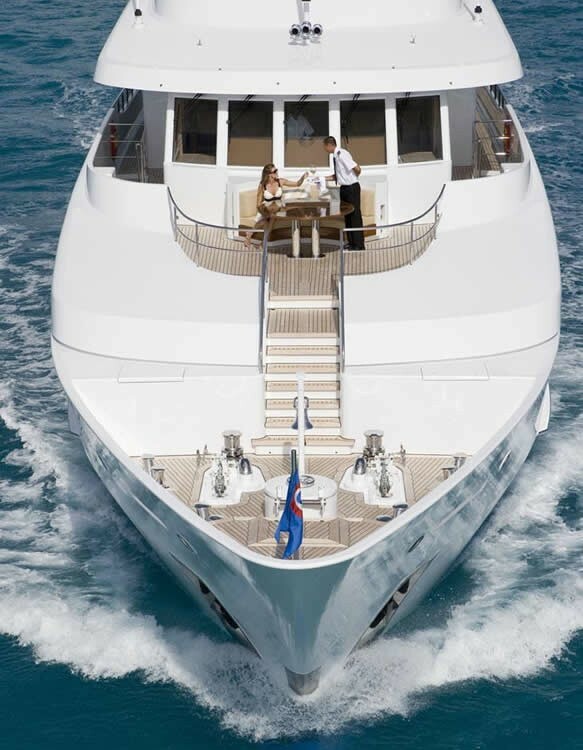 Two Yamaha 3 person jet skis 15.8m water slide (from sun deck) Water trampoline, Two Seabobs, Two paddle boards/wind surfers, Two 2 person kayaks, A third lung (floating compressor for shallow diving), Snorkeling gear, Rendezvous diving, Multiple inflatable towable toys Water skis (adults and children), Wakeboards, Beach toys, Beach BBQ with shade tents, Exercise equipment: treadmill, with TV and headset hidden under sun pad on aft sundeck, free weights. 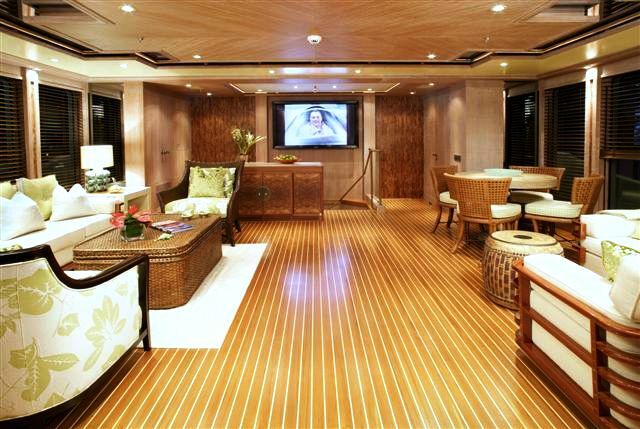 Full audiovisual facilities are also provided in the form of a Kaleidescape system with 3,000 hours of music CDs and movies. 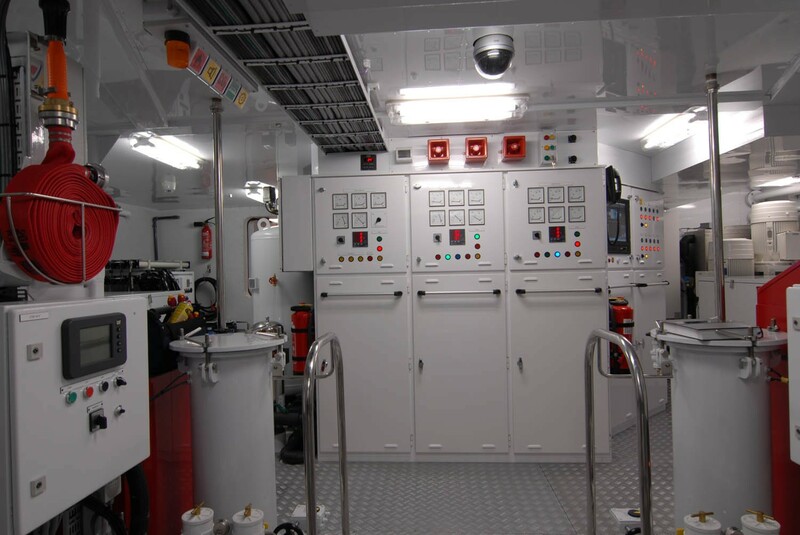 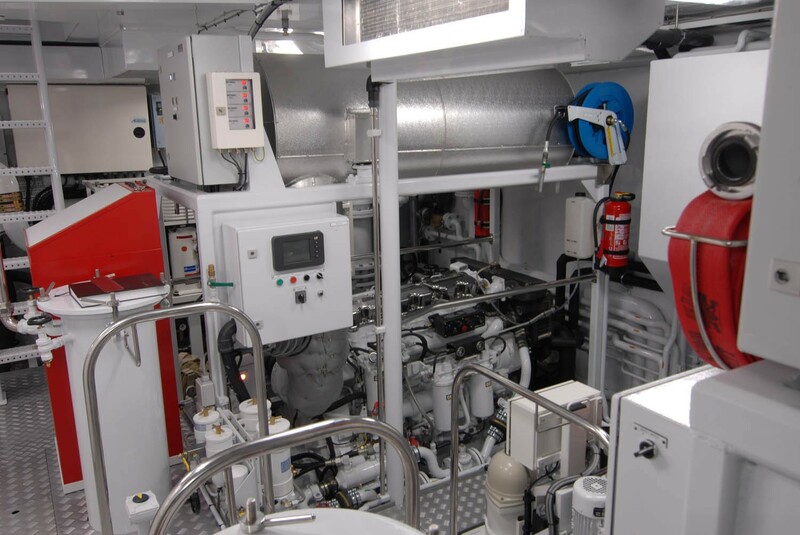 Communications facilities include VSAT and WiFi internet throughout. 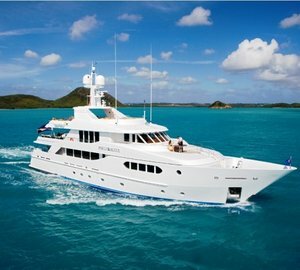 Satellite coverage in Caribbean and USA only. 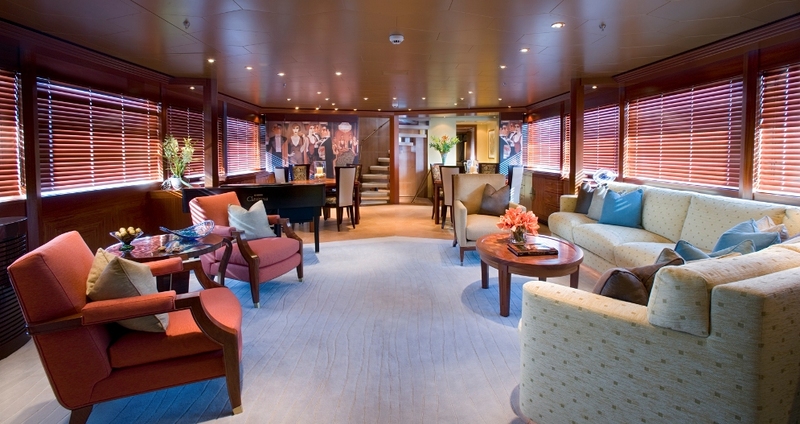 PERLE BLEUE Main Saloon Too. 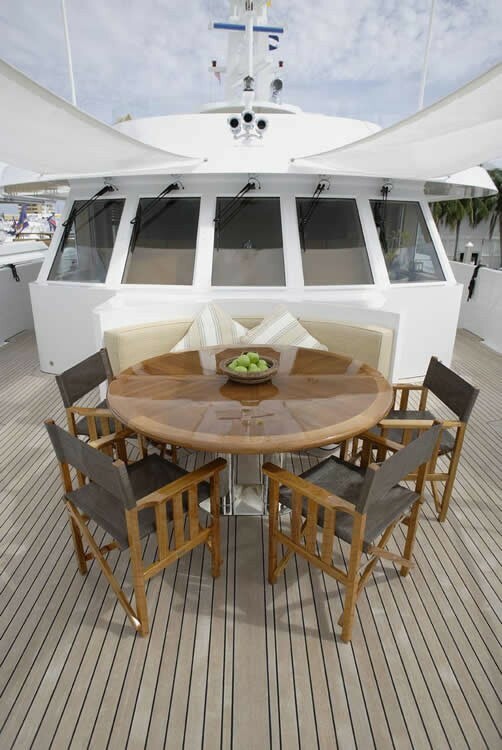 PERLE BLEUE Main Saloon Tables.